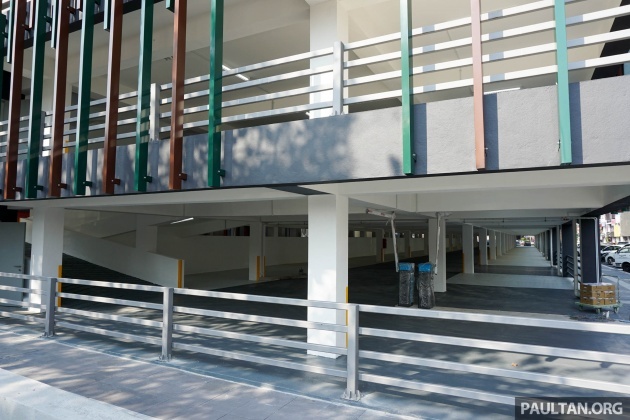 The federal territories ministry is looking into constructing multi-level car parks in a number of People’s Housing Project (PPR) locations to address the shortage of parking space for residents, Bernama reports. According to federal territories minister Khalid Abdul Samad, the implementation of multi-level parking projects were being studied by the Kuala Lumpur City Hall (DBKL). “We will do (construct multi-storey parking) in phases at five or six PPR locations to ensure each resident has his own parking space and to ensure roadways are vacated. This is important in the event of an emergency in a PPR area so that the police and the fire and rescue department can enter and provide immediate assistance,” he said. The PPR housing locations for which the covered car parks are planned were not mentioned, and it’s not known if they are part of previous plans, or additional projects. Back in 2016, DBKL had announced it would build multi-level car parks at 13 PPR and public housing (PA) locations, adding nearly 2,700 parking lots to that which was available. The PPR areas mentioned then were Pekan Kepong, Intan Baiduri, Raya Permai, Seri Pantai, Kampung Baru Air Panas, Hiliran Ampang, Taman Mulia, Desa Tun Razak, Desa Petaling and Semarak, along with three PA locations. Why not they build more train stations connecting these PPRs? Oh wait, this Govt is prioritising private car ownerships instead of more efficient public transportations. Penny wise, pound foolish, short term thinking Govt. Not economic viable, furthermore train can’t travel zig-zag across streets and building just to interconnect these PPRs! To avoid sharp bends, how many premises and land needs to acquire and dismantle just to clear for laying train tracks? Can be done, Japan has showed us how to do it. Whether this Gomen has the balls to do it or not, but from the looks of things, for sure no balls! Incurred huge debt, going deep into recession, disminishing market just to copy a loser mation? this is a good idea. Lucky the New Government cares for the low income people. Our cars are our biggest assets and now, at least we can keep our cars safe. Pity the past Government did not think of such a good idea. This is because they only cared about making the rich safer and richer. Lolz! Basher inadvertently praised previous Gov and bashed his own. Habislah Basher! No pay this month! Bravo DBKL, previous FT minister too busy. One DBKL flat family alone own 2-4 cars, Summore Astro n Unifi. So more parking needed. True! my neighbours alone owns alphard veilfire, vios trd, myvi, axia, couple of kapchais. Close your eyes and imagine you are at a PPR flats. What do you see? Garbage? Graffiti? Vandalism? Broken children bicycle? 1st world Malaysia with civilised society. The Low COST FLATS build by the Government are HEAVILY SUBSIDISED (( up to 50% of the Actual Cost ) as they are for “NEEDY Rakyat”. If that is the CASE then why are they HAVING CARS ? (M/Cycle is Sufficient). But if they can affort CARS , then they should also affort to PAY for the CAR PARK SPACE. As such , ALL CAR PARKING SPACE in Public Flats should be SOLD/Rented out at MARKET Price. The Revenue can then be used for MAINTENANCE of these Public Flats. When apartments were build, developer trying to save money by not having a land to build multi storey car park, or multi storey car park and top is the apartment to save cost or to make more profit especially budget apartments. future development must take into consideration whatever units they are going to build, there should be 2 car parks per unit. LRT/MRT/KTM car park are so limited, its always full and not sure why no multi storey car park was build, take kelana jaya as example… that open land for car park, one could build multi storey, but guess cost is the factor. which than should tender out to concessionaire to build and managed and collect a fix fee for maybe 10 years, 20 years. Almighty PH, not only PPR places need MSCP. Various condos and apartments do require that to, like the Residensi Pandan Mas area. Please use common sense and take a look at that area. How on earth can DBKL approve such town design? Even a dog knows what is right and wrong. Please wake up. Thanks. just cant quite get it.. PPR is for those unable to buy/rent expensive houses, why not build more house rather then multilevel car park? Will eligible taxpayers be able to demand such facility in their neighborhood from the government? After all, they contribute to the government’s coffer, right? They should. Now is the New MY era of demanding taxpayer. Shopowners as well should also demand to place ramps at parking lots in front of their shops. After all, businesses pays even more taxes than parking lot users, so they should get higher priority if following those demanding taxpayer logic. if they can afford cars, they are no more in B40 group. our government is helping the B40 group but taxing the T20 who work hard. the B40 can enjoy abundant car parks with subsidise fuel, not paying income tax, cheap PPR housing. How then can we remove the tongkat so that they can learn to progress too? luckily most of them didn’t drive civic 1.5T. else they shouldn’t stay in PPR as the car more expensive than their house. By the way, it’s not only a luxury car, it’s a luxury sports sedan with good resale value and fuel economy. Exactly. Penalise the skilled and hardworking but reward the lazy. But again, B40 are the easiest to manipulate with larger voting base than T20 and requires lesser money to satisfy than M40. That’s how you control the people. if you want to remove tongkat, stop ‘weaponizing’ meritocracy to give advantage to certain demographics in society (Penang FTZ comes to mind, almost all factories management dominated by single ethnic, guess which one..). get your T20 to stop hiring foreign nationals, tell them to hire locals at fair wage (what is fair wage? how about poverty line level, around rm3k/month, thats right anything below that mean youre living in poverty). thats a good way to ruin economy. if you want to enforce higher minimum wage then prepare for higher cost of living. and no need to guess which ethnic is more hard working and frugal and dont depend on tongkat, unlike the majority who are parasites and leech off the taxes paid by hardworking ethnic minority who contribute to growing nation economy. when working husbands and wife willing to spend 10-12 hrs a day away from family in order to earn below poverty line wages isnt hardworking enough, most side lined by employers for cheap (sometimes illegal) foreign labour, which drives down wage prices. at the same time, scientific study by UM shows local grads discriminated even when equally qualified… hardworking lah sangat, meritocracy lah sangat. Previous Post: Ottimo jenama baru, bakal perkenalkan kapcai 110 cc?